A fascinating historical and informative read. Until... I found out that Jim Murphy, one of the best non-fiction writers for young people writing today, was writing a book about the Cardiff Giant. 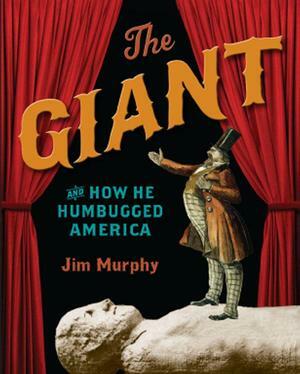 His new book, The Giant and How He Humbugged America tells the whole story of the 10-foot statue (originally thought to be a petrified man) that was found underground on the Cardiff farm of William Newell in 1869. From the heated arguments that ensued about the giant's authenticity, until the giant was officially proven to be a hoax some months later, it reveals the story behind the giant - where it came from, who made it and why they went through all the trouble of trying to humbug (deceive, trick, bamboozle) the entire United States! With the town of Cardiff just over the hill from LaFayette, the unique story of the giant that was found there so long ago is one with which we should all become more familiar.